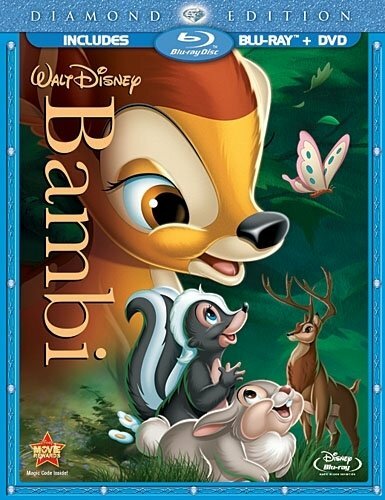 Disney's classic animated feature Bambi is once again available on Blu-ray, this time part of The Signature Collection. This version is called the Anniversary Edition... I'm assuming they're referring to its 75th anniversary since the movie was originally released in 1942 and it is now 2017, but they don't explicitly say this. This version looks exactly like the previous blu-ray release, at least so far as I remember. It has been around six years since I watched that one. Disney always does a great job of cleaning up films and making them look great for HD and Bambi was no exception. All of these extras are on the blu-ray and digital HD, the DVD gets left out of the bonus arena and only contains the movie. I'm unsure as to why since the movies is only 70 minutes long there is surely enough space to add at least some of the extras. The digital HD also contains an extra bonus feature that's not on the blu-ray, a featurette called Celebrating Tyrus Wong . Although I don't much care for the movie, this release is pretty good, packed with a bunch of extra features that includes deleted scenes and animated shorts. If you don't have Bambi on blu-ray and you want to, this would be a good release to pick up. If you already have it on blu-ray then there isn't much reason to get this release.